You have, no doubt, heard that unless you’re good at online marketing for your business, you will be left behind in the 21st century! It’s plain and simple…if you don’t master (or have someone do this for you), your business will suffer because your competition is already figuring it out. I’ve said this previously (How To Increase Your Social Media Presence For Your Business) but it’s worth repeating…there’s soon to be no more Yellow Pages and you won’t be able to rely on “Let Your Fingers Do the Walking” anymore. What’s your plan B? 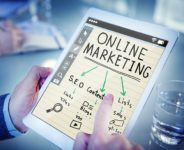 Well, in this blog post, I will cover the 4 pillars to a successful online marketing plan for your business. My intention is to help you make your Plan B become Plan A. Your goal when marketing online or offline is to develop a relationship with your customer, but how do you do that online? Clever online marketers figured out a long time ago that “the money is in the list.” In other words, if you can get a big list together of people who had some interest in your topic, you could give those people a chance to buy stuff, and make a pretty nice living doing it. The reality is, the direct mail (known to most of us as junk mail) folks had this figured out decades before there was such a thing as the Internet. And because it costs money to send direct mail, they also figured out another very important piece: Not every list is created equal. Your list is your community and you should treat them like you would treat your friends. Once you have them on your list, you need to email them on a daily basis and offer them something valuable (a tip, strategy, your best expertise) so they will keep coming back for more. Of course, you also need to be clear and let your community know that you will occasionally be offering them products and services to buy so that they aren’t blindsided by that when you send your first promotional email. If you don’t get this right, you won’t be too successful. The first thing you need to master is the art of writing a good headline because the role of a headline is to grab the reader’s attention so they read the first line of your copy. “Your copy” in this case might be a blog post, a sales letter, a landing page, or even a lesson in a free e-course. If the headline does that job, it worked. If it doesn’t do that job, it failed.More people will read your headline than anything else you write. They read it in your Twitter stream, they see it fly by in their RSS reader, and it shows up in their email inbox. Mastering headlines doesn’t automatically make you a great copywriter, but it is a skill you’ll need if you want to effectively market anything. There’s a copywriting class that I took and I highly recommend it called Copywriting Mastery. Another training that I highly recommend is called 5 Winning Headline Formulas which will give you 5 proven ways you can instantly grab your prospect’s attention and pull them into reading your sales letter or watching your video. After the headline, the first paragraph, your image captions and your P.S. lines are all important. Content is king and if you do it right, you’ll build your list (community) and will be able to be in profit in no time (ok…maybe, I’m exaggerating a little bit. It does take some some time, but if you’re good, it shouldn’t take too long). In order to write great content, you have to really know who your target market it. What do they do? What do they buy? How do they spend their free time? How old are they? What gender are they? What other leaders in your niche do they follow? When you know the answers to these questions, it will be easier to create content so that they are attracted to you. This is what we call attraction marketing. If you get your name out there as an authority who constantly gives people what they need and want, people will seek you out. The most important thing you need to remember is that your content must always be focused on your customer…it’s NEVER about you and it’s ALWAYS about them. You can mix it up too. Make some posts educational, some posts entertaining, and then 1 out of every 5 posts can be promotional. Syndication??? What the heck does that mean? It’s simply the act of spreading your message all over the internet. There are lots of different ways to do that including social media, guest blogging, paid advertising on Google & Bing, Banner Ads, Direct Response Advertising (you know…that junk mail you get every day in your snail mailbox), Classified ads in newspapers…and the list goes on. In my opinion, the fastest way to accomplish this task is to use social media. That’s a whole (many) different lesson altogether, but for the purposes of this blog post, suffice it to say that you need to pick your favorite social media platform (for me, it’s Facebook) and master that one until you’re consistently bringing in 10+ leads per day. Then, you can add another one into the mix. Hopefully, now, you have an idea of how this whole online marketing thing goes and we will definitely be having many more conversations about the details and how-to’s work. Please leave me comments and questions below and I promise I will answer each one as quickly as possible. P.S. If you want to be an insider with access to the attraction marketing system that I use, you’ll definitely want to CLICK HERE!